I had a number of lovely comments about the Covered Tape Measure that I made for Carla as part of Linda’s Pincushion Swap. So I have whipped up a couple more and made a tutorial for those that are interested! They are quick and easy, and a great way to use up those little scraps! You can find the Tutorial here! I have also added a link in the side bar. EDIT: The cardboard template is removed after you have pressed the top and bottom pieces. EDIT: Have just added some new photos for a Flower Tape Measure here. 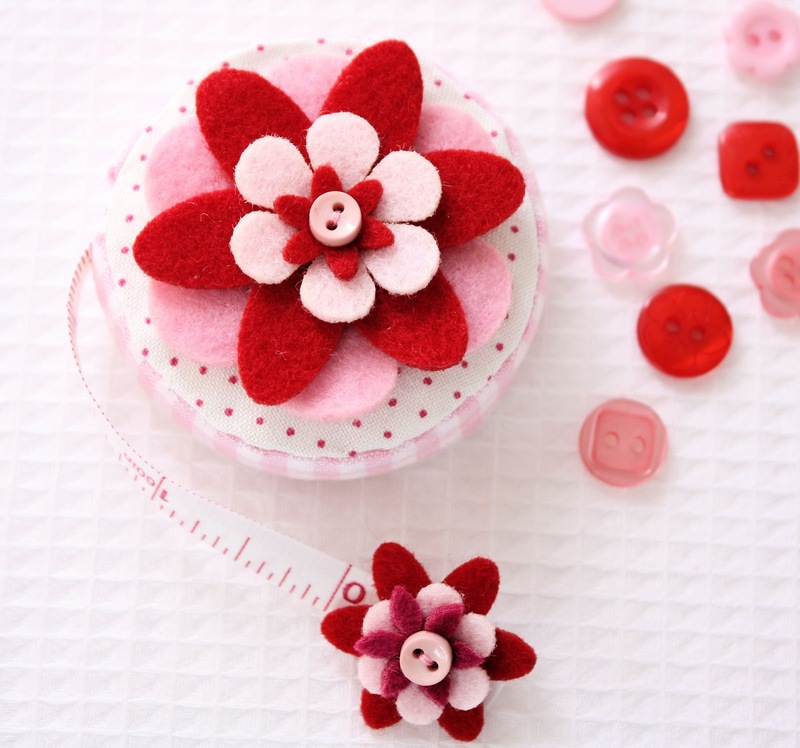 You can embellish your covered tape measure by adding embroidered details, yo yo’s, buttons, appliques etc. If you make any, I would love to see them! Love this! Thanks for sharing – However…remember you didn’t know what Mod Podge was, well…What the heck is vlisoflex (Sp?) Going to put this on my to do list…your handsewing (slipstitch) is fantastic. Did you sew from the inside or outside? I don’t see a stitch at all. What a great idea girls. I’ll be saving that tutorial for sure. Love it however the link takes me to Google Page Creator…hmmm! Awesome; thank you for the tutorial! This will be on my project list for the coming weeks! Thanks, Lisa. I was wondering how you did that! I love tutorials. 🙂 A good little stocking stuffer for a sewer I know! you’re so clever and super crafty! will try your tutorial soon! I’m going to check this out. Thanks so much for doing the tutorial. I agree it would be a great stocking stuffer. Thanks for the tutorial, it was so kind and sweet of you. I love those tape measure covers. I would keep them out with my sewing and craft as they add there own creative inspiration. Thanks for the tutorial! Can’t wait to give it a try! What a great tutorial – its really well written and beautifully photographed. I can’t wait to give it a go. That is so awesome! Thanks for the tutorial! How fabulous. Thanks for sharing. Thank you! This is going on my to-do list for Christmas-presents!! so cute, and so clever! Great tutorial. If it’s ok with you I’ll link it on my blog, some of the swappers may like to include it in their swap bags. You are so very clever! Thanks! I can’t wait to have a go at these! thanks for the tutorial! i’m thinking of making a cute cover for my husband’s construction tape measure, hee! This is absolutely delightful! Thank you so much for the great tutorial! great tutorial. Hopefully i’ll get some sewing time in tonight – we shall see. maybe if I did this, I wouldn’t loose my tape measure as often! Wow that is great thanks for the tutorial. I will have a go Very clever PDF I haven’t mastered that sort of technology yet. Fabulous! Thanks for the tutorial. It’s so easy to follow, just the way I need it! Wow Lisa, this is just fantastic!! I know heaps of people who would love this as a little christmas gift – thanks!! It’s a great tutorial and your photographs make it easy to follow – thanks! those tape measures are brilliant, I love them!!! This is awesome! Thanks for the tutorial! What a treat for everyone. I like the applique idea as well. Wow! what a great idea!!!!! Good idea to make for my quilting friends! Great tutorial – thanks for sharing! I love the covered tape measure!!!! How fun is that? Love it! You have such a fun blog! i need to get a little stock pile of tape measures so i can make bunches!!!! I also love the tutorial and appreciate it very much. Like the other Susan, I wondered about the cardboard… leave it in, take it out? What great little gifts these will be! That is so cool and so timely! I have a covered one that I adore and recently bought a bunch of uncovered ones to make. Of course, I had to figure out how to do it and now I don’t! Thank you! Lisa, your tutorial looks lovely! Thanks for sharing it with us! I want to give this a try. Of course I need more time in my day to get all of the things I want to try done. Hopefully I can try this soon. How cute! Thanks for the tutorial! I am going to have to make one. Maybe one for my husband too, I can just see him carrying one around on a construction job. It’s been a while since I’ve stopped by for a visit. I have been much too busy! There are so many cool things to see. I wish I could smell your soap. Your Baby Lime Syrup Cakes look divine. And, I love the covered tape measures. Mine is a hideous pink plastic thing. I can’t wait to try this. What a brilliant idea! Thankyou so much for the tutorial, they will be perfect for little Christmas gifts. Thanks so much for the tutorial. It’s been added to the “TO DO” list. love this tutorial. hope you don’t mind i’ve linked to it from my blog. I am an avid crafter and a team member of our local community craft group, which is a not for profit organisation, in fact we only charge a $3 entrance fee to cover costs and offer free craft classes (none of the teachers get paid and they teach voluntarily). I was wondering if you would kindly give me permission to copy your tutorial instructions and teach a small group of ladies your Covered Tape Measures. I have made a number of these wonderful Covered Tape Measures myself as gifts for crafting friends and as we are always looking for new things to teach at our group I thought that this would fit in nicely with my theme for next term called ‘One Week Wonders’. I am hoping to teach quick to make crafts that can be completed in a couple of hours. I wait to hear your response and any conditions that you may have. I would love to make this, but your bandwidth has been exceeded. Can I get your 4 tutorials in e-mail form? mlhefner at gmail dot com. Thanks! Thank you very much, Dear Lisa!!! Thank you so much for this tutorial. I made this tape measure cover and it was so easy to do.